Attachment-Informed Grief Therapy bridges the fields of attachment studies and thanatology, uniting theory, research, and practice to enrich our understanding of how and why people grieve and how we can help the bereaved. In its pages, clinicians and students will gain a new understanding of the etiology of complicated grief and its treatment and will become better equipped to formulate accurate and specific case conceptualization and treatment plans. 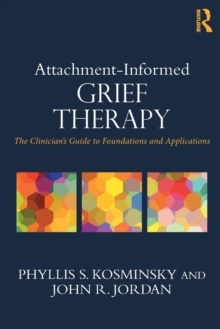 The authors also illustrate the ways in which the therapeutic relationship is a crucially important-though largely unrecognized-element in grief therapy, and offer guidelines for an attachment informed view of the therapeutic relationship that can serve as the foundation of all grief therapy.